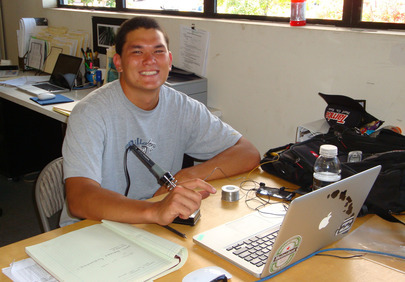 Kiah Imai was born in California but raised on the island of Kaua‘i. He is currently pursuing a B.S. degree in Electrical Engineering Technology at Michigan Technological University and will be graduating in December 2010. He enjoys the outdoors, hiking, going to the beach, and hanging out with friends. A client’s macadamia nut farm is located in a remote location where power is not supplied by the electric utility. Currently, two diesel generators are used to power the farm’s machinery at a cost of $350 per month for fuel. The goal of this project is to design and install a self-sustaining “off-grid” photovoltaic system that provides clean, renewable energy to the farm. The system must be designed to provide power to run the farm’s processing equipment for a full eight-hour workday. The cost of the system is not a major constraint, although valid reasoning behind the design must be presented to the client. A data acquisition system was used to measure power consumption of the machines during normal working conditions over the period of a day. The maximum load, including overhead, was found to be 12 kW, so this was used to estimate the size of the solar array and battery bank. The size of the proposed solar array was also determined by the DC-to-AC derate factor, the anticipated hours of direct sunlight, the size of the battery bank, and the expected daily power consumption. Likewise, the necessary battery bank capacity was determined using the DC-to-AC derate factor, the daily power consumption, the depth of discharge of the battery bank, and the number of days of autonomy. Taking all of this into account, it was concluded that the array should be large enough to generate 38.67 kW, and the battery bank size should be 240 kW·h. The overall system will supply 12 kW of power for a full 8 hours per day and would provide one day of autonomy. In the case of continuously bad weather, a backup generator will be used to charge the batteries and/or provide direct power to the equipment. Due to the system’s large size and commercial environment, only a preliminary design and layout of the solar array and battery bank could be determined.